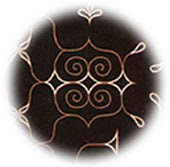 In my previous post on Ainu designs, I introduced the morew (swirl, or spiral) pattern. Another often-encountered design is the ayus (having thorns), which consists of straight and curved parallel lines with pointy segments embedded at regular intervals. The ayus pattern is often embroidered or appliqued onto garments, as well as carved into various wooden tools such platters and prayer sticks. The pattern can be used alone or in combination with other designs, such as morew, for the purpose of protecting the user from evil. The attached photo shows leg coverings embroidered with this pattern. Traditional Ainu designs are based on natural phenomena and are usually depicted by women in embroidery, and by men in wood carvings. One of the basic designs is this one called morew (swirl). It represents the spirals occurring in such things as oceans, rivers, winds, and vines twisted around tree trunks. 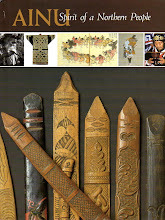 The regional variations are distinct enough that artifacts can be easily identified by their patterns as originating from either the Hokkaido Ainu or the Sakhalin Ainu. The morew pattern is often embroidered on clothing near the openings and edges (vulnerable areas where evil gods can gain access). These garment decorations are referred to as "flaming borders" in the yukar tales, and are supposed to give ancient heroes power and protection from the enemy. The morew has also been found carved into wooden paddles which were apparently used in whale hunting long ago. 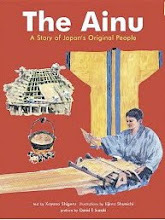 I will be introducing other basic Ainu designs in future posts. 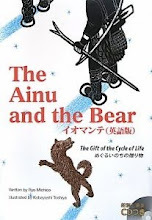 From today, and up until the winter holidays, I will be posting, at the rate of once a month, recommendations of Ainu-related books and other items as gifts (especially for children). Today I'd like to recommend a picture book I've mentioned before. 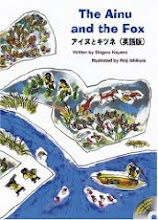 The Ainu and the Fox is a yukar from the Ainu oral tradition, retold by the late Ainu activist and archivist, Shigeru Kayano, and translated into English by Project U-e-peker. Kinji Ishikura's delightful illustrations bring the setting and the characters to life, giving even greater impact to the touching environmental message of the tale. Reading level is appropriate to native English speakers ages 9-12. 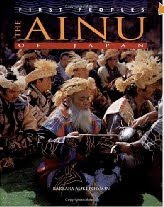 There is a slightly more expensive version of the book which comes with a CD recording of full text narration and two tonkori instrumentals by the Ainu musician Oki. This version can be ordered directly from the R.I.C. Publications website.